Don’t you often wish that your favorite music would follow you around as it seems to do in the movies? Well it seems I am being granted my wish these days. Whether sipping a pomegranate martini at Drink, trying to hold a yoga pose at Exhale or shopping on Newbury St, I find myself being serenaded by one of Stephane Pompougnac’s Hotel Costes compilations. And I admit… I love it! Pompougnac began his career as a DJ in France at the age of 18 but is perhaps most famous for his gig spinning at the Hotel Costes at 239 Rue St.-Hónoré in Paris. He released his first Costes compilation in 1999, setting the tone with his unique combination of world sound, soul, house, and old standards. “My Funny Valentine” by Big Muff says it all. Eleven Albums later, his albums are still relevant and fresh. I have tried many other artists, but none seems to have the staying power of Costes… they grow on you slowly and you can listen again and again.. and again. I would complain about the over-exposure, but for some reason everytime I hear “Sous Le Soleil” I get a little groove in my step and can imagine I am sipping a Rhum Vanille on the beach in St Barths. It just makes me smile. 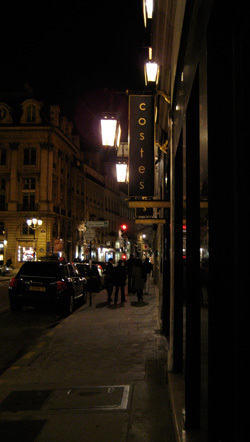 A little while ago I was lucky enough to have drinks and dinner at Hotel Costes in Paris (how could I NOT go!). You enter the hotel through a hall of mirrors (pretend you know what you are doing) and are eventually led to the boudoir-like dining area. The opulent, chic and seductive atmosphere did not disappoint and the people watching was definitely amusing. I sat back and could imagine the days when it was actually Pompougnac spinning in the little DJ booth. Very romantic. The hotel bar is now a classic rather than THE place to be, but this seems to fit with Pompougnac’s music… it has staying power. For those of you interested in taking the Costes plunge, I recommend starting with No. 4… it is still my favorite. I am so jealous that you have been to Hotel Costes. I was not acquainted with the music but am fascinated with the hotel since I sampled their fragrances.